Bathtubs are not everyone’s necessity. But it is needed if you need to relax while bathing or enjoy soaking after a tiring day. Of course, a shower in the bathroom suffices the purpose but the bathtubs add extra luxury. Furthermore, if you have small children then you will find bathtubs much more helpful while bathing your children. 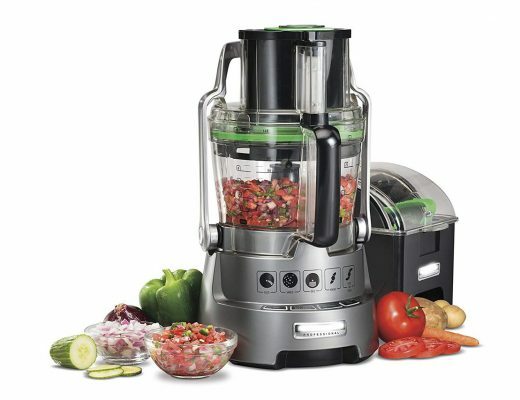 If you are looking to buy one, it is your first time or you are replacing your old one, there are a variety of options available based on styles, types, features, and price. You will find the one that will fit your bathroom and pocket, but first, you need to do a little digging. The research can be confusing and be settling for one particular bathtub can be really puzzling because there are so many options. It is not only about the design of the bathtub but also the features it has. Since buying a bathtub is a long-term investment, you need to be careful while choosing. We have prepared this post as the guide for you to choose the right bathtub for your bathroom and make the best deal. With all kinds of information you need before buying, you will be more likely to get the right one. Bathtubs are there to enhance your bathing experience and give you extra comfort and luxury. There are several types of bathtubs to fit the varied needs of the users. Enclosed by walls on three sides, alcove tubs have only one open or finished side. These are perfect if very less space is available for a bathtub. They are the easiest and the cheapest bathtubs you can get and install. The walls can be tiled or paneled and the enclosure can be used for tub/shower combination. Since the alcove tub occupies very less area, this can be opted to maximize space in your bathroom. Generally, alcove bathtub measures from 53 to 72 inches in length. Also known as generic bathtub, this bathtub serves its purpose for family members as well as the pets. This is the most familiar bathtub and is nothing fancy. But it definitely does its job. 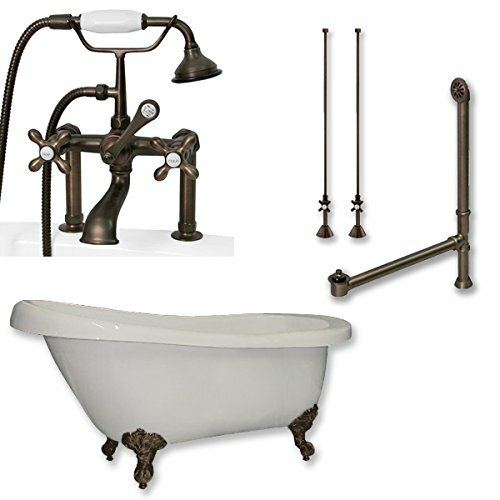 This bathtub adds extra elegance to your bathroom giving the Victorian/retro look. Walls or any other surfaces do not enclose the freestanding tubs. The freestanding tub sits by itself on the bathroom floor and does not require any adjacent support structure. 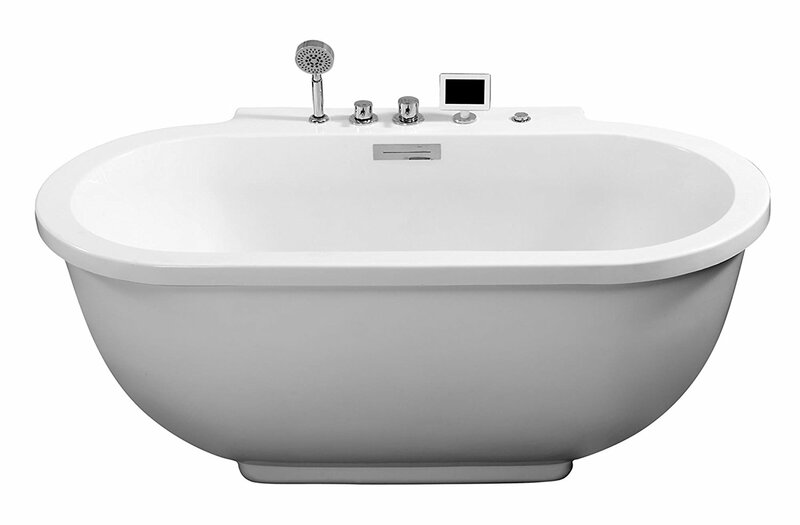 This classic tub needs a large and spacious bathroom as it needs a buffer area around the tub. These freestanding tubs are all about freedom so they require more space. You need to have more money and more space in your bathroom if you want a freestanding tub for yourself. They are expensive than alcove or drop-in tubs. Clawfoot, vintage tubs, slipper, and deep soaker tubs are the examples of freestanding tubs. Deep soaker tub or soaking tub is deeper than usual generic tub to allow you to immerse your whole body into the water. Slipper tub provides comfortable lounging position with one or both end rising high and sloping inward so that you can recline as you bathe offering support to your back, neck, and head. These tubs reflect the antiquity and there are various sizes, styles, and shapes to choose from. You can clean underneath the tub since the legs provide the space but the tub has exposed plumbing. You can buy specialty-plumbing parts to cover up the exposure. A walk-in tub us easily reached by a level surface, unlike the generic bathtub where you have to step over a two-foot side of a tub. This feature of the walk-in tub makes it suitable for seniors and physically challenged individuals with the ease of entry and exit. If you are worried about how it can contain water without leaking, then let your worry go. The special device at the door acts as a seal to hold and contain the water. A simple release button allows water to drain after use. Whirlpool tubs and air tubs provide a therapeutic bath by shooting water and air bubbles into the bathtub at strategic locations to give you the body massage effect. This type of tub injects water into the tub, stirring the water whereas air tub pushes air into the water creating thousands of bubbles that stimulate the water. These kinds of tubs are expensive than others as well as more complex. They include pumps, filters, hoses and other equipment necessary to circulate and invigorate the water. If you have an obstinate corner in your bathroom, then you might want to think about installing a corner tub. A corner tub is the best way to utilize such unused corner space. Though the corner should imply three sides corner tub has five sides. This kind of tub not only needs a corner but also huge space and they tend to be expensive. Also, the tub’s capacity is huge so it takes more time to fill. But if you want to share a bath with your other half and have some quality time, then this might be the perfect tub for you. Plus, it has an extra ledge space all around so that you can adorn with your favorite bathroom accessories. When you are buying a bathtub it is as equally important to understand the materials that bathtubs are made of as the different kinds. Bathtubs are made from various materials and each has its own pros and cons. And certain types of tubs are only made from certain materials. Cast iron is generally covered with a porcelain enamel coating. It is one of the most durable materials that give reliable service for years. Since cast iron tubs are heavy when combined with water, hence they require a good support structure. Usually, alcove or freestanding tubs are cast iron tubs. Their finish is durable and can be easily cleaned. Eventually, when the enamel wears out and chip away, the cast iron substrate can be seen and that might rust. These are also called as porcelain on steel. They look similar to the cast iron tubs but they are lighter than them. Hence, unlike cast iron tubs, these tubs can be easily maneuvered when remodeling the bathroom. Their surface is easy to clean and they don’t rust if the enamel gets scratched or chipped away. Acrylic is a form of plastic that is used to make bathtubs. It looks similar to the enamel on cast iron and steel tubs but is much lighter than the both. The surface is highly glossy can easily get scratched but can be repaired more easily than a porcelain enamel surface. It is mostly used in making whirlpool and air tubs as it is easily formed material and can be made in different shapes and sizes. Fiberglass-reinforced plastic (FRP) is another material that is used to make bathtubs that are covered in a material called ‘Gelcoat’. Mostly whirlpool and air tubs are made from this material as it can be shaped easily. The tubs made from FRP have smooth and glossy surface because of the gelcoat and can be cleaned easily. It looks like acrylic but it is not as durable and can be damaged easily. This includes American Standard’s Americast products and Bootzcast from Bootz industries. The backing of these tubs is made with proprietary engineered composite materials. The tubs made with composite material have enameled finished surface. These are intended to achieve benefits of cast iron like heat retention and durable surface but weighing much lighter. It is a form of ‘engineered stone’; crushed marble is combined with resins to produce a solid surface product. It is almost the same as the quartz countertops. Cultured marble is usually covered with a clear gelcoat to offer a durable surface finish that is stain resistant and can be cleaned easily. It has the ability to be ‘cast’, poured into a mold and formed making it a good material to make bathtubs. The downside of cultured marble is that it is a brittle material, which can crack with over-tightening of a faucet and other fixtures. A wooden bathtub looks beautiful and unique but has some conditions. 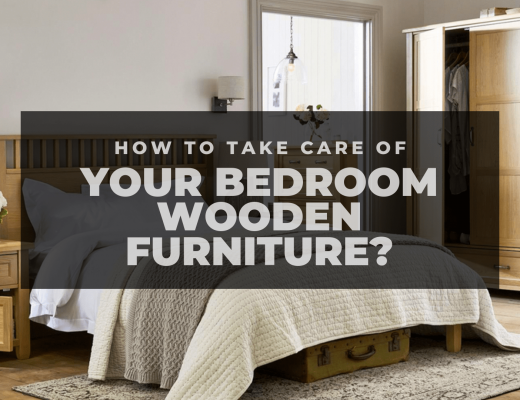 The surface of the wood needs to be sealed very nicely to prevent it from deterioration. Since several slabs are pieced together, they need to be tightly joined and sealed to prevent leaks. The durability of the tub made from wood is questionable since water and wood are not so good friends. The installation of the bathtub varies depending on the type of bathtub. Alcove tub is accessible from only one and its three sides are installed adjacent to walls. It is designed for right hand or left-hand installation, which means the drain is either on the right or the left side as you face the tub from its accessible side. Most of the whirlpool and air bathtubs use platform installation. Also known as deck mounted and drop in, platform installation is placing the tub within a built-up deck structure with its rim at the same level as the top of the deck. These kinds of tubs have removable panels on one side to make the plumbing and other hardware accessible for fixtures. The drop-in tubs can be installed down into the bathroom floor with the rim flush with the floor. But this type of installation makes it difficult to move in and out of the tub. An undermount installation is similar to platform installation except a surrounding stone or tile deck top covers the rim. The floor structure underneath the tub supports the tub. While installing you need to consider the type of a deck top you are using whether you will need to remove the tub. You have to break the stone deck top if you ever need to remove the tub. The freestanding tub sits by itself and does not need any adjacent support structure. However, this kind of tub needs to be placed near the delivery and drain plumbing. The corner tubs can be installed alcove way or the platform way. You just need to consider the location of the fixtures. Also, consider the orientation of the tub and make sure you don’t have to climb over faucets and spouts. Bathtubs can be stylish too. The gentle sweep on one end looks graceful and also provides support to your back, neck, and head, just like a lounge chair. The wooden ones are simply beautiful and classy. If you love freestanding soaker tub but have a mall bathroom, don’t worry. There are many manufacturers that produce smaller soaker tubs designated for smaller spaces. What is more relaxing than a hot bath after an exhausting day? Soaking in a tub filled with hot water. Many air tub and whirlpool tubs feature heaters to keep the water hot. And some have electronic controls that control overall functions such as heat control and water pressure. The conventional tubs like alcove do not allow soaking. But there are some models designed to hold more water to allow you to immerse deeper into the bath. Thinking of fancy bathtubs? How about bathtub featuring light and sound? Some models of Kohler offer soothing instrumental music that you can hear it above or below the water surface. You can also integrate your own playlist with their DTV-Bath interface. Also, these bathtubs feature LED Chroma therapy lights to stimulate your visual sense and soothe your mood. What do you want from your tub? You should be sure of the use of your bathtub, either you want it just for bathing yourself, family and pets or you want some relaxing spa experience at your home. Since replacing the bathtubs often is not so easy, you should decide which kind do you want? Alcove tubs are more suitable for general use and for children while deep soaking and whirlpools are relaxing and luxurious. Also, you can look for some hybrid models, which can do both. Are you going to place a bathtub for the first time or you are replacing your old one? This matters a lot because if you are placing it for the first time, you will have more options and very fewer limitations. 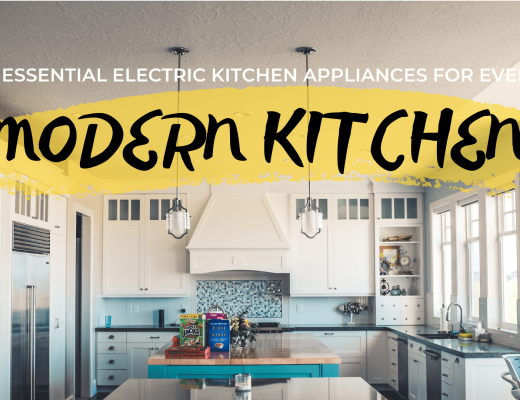 But if you are replacing your old one, then you have the limitations regarding available space, plumbing, etc. Do you really want to replace your existing tub? Removing an installed bathtub is not an easy job. Consider all your options carefully before making the decision. If you are thinking of replacing your bathtub because degradation of its finish, you can consider recovering it using bath re-liner services rather than replacing the whole tub. Any bathtub should be comfortable despite its kind. Try to understand the ergonomics of the bathtub before actually buying it. If you are buying soaker tubs, then you should make sure that it is comfortable as you are going to spend more time in than conventional bathtub. This is to consider only if you are getting a whirlpool bathtub. Check if the jets are located where you want them to be, directed at the back or close to the feet. You should be aware of your floor capacity before installing a bathtub. Soaker tub holds more water, which increases pressure on the floor. Make sure your bathroom floor can hold the weight of the tub you are getting. We have now talked about the types of bathtubs, the different kinds of materials that the bathtubs are made of, the installation of different kinds of tubs, and the factors we have to consider before actually buying a bathtub. To further assist in making the final decision, we have made the list of the best bathtubs. This American Standard bathtub allows you to take long, relaxing bath as well as bathing your children. Along with being 50% lighter, this bathtub made of Americast material is more durable than the traditional cast iron bathtub. This traditionally styled bathtub features right-hand outlet. The tub has an integral apron that makes the installation easier and cheaper. It features a beveled headrest and lumbar-supportive contour that makes it more comfortable. It has a StanSure slip-resistant surface so you won’t need unsanitary mats or tapes to prevent slippage. The glossy porcelain finish makes it look terrific. 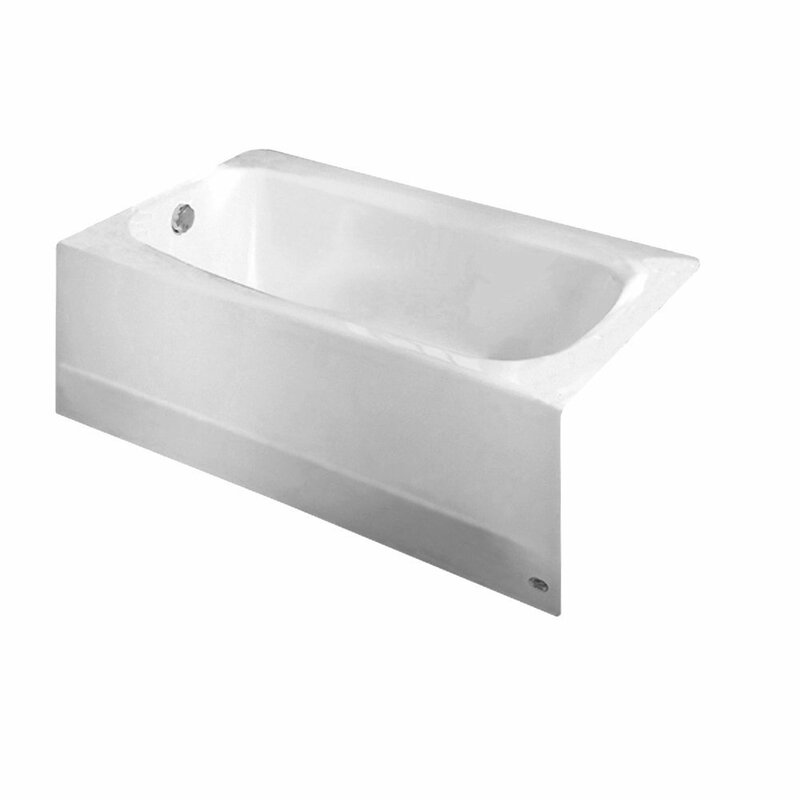 Cambridge is a 5-foot bathtub, which can be a perfect addition to your bathroom. This bathtub by Kohler is a 5-foot design offering a luxurious bathing experience. It features an attractive curved apron to provide extra room to soak. The curved integral apron bows to 38” at the center. It is made of acrylic and features left-hand drain. The integral flange feature helps prevent water from seeping behind the wall and makes the alcove installation easier. This one is a pretty big tub, enough for a soak for two persons. Also, it is comfortable and you will enjoy this sleek and stylish tub. This bathtub with a contemporary design harmonizes with different types of bathroom fixtures. You might want to consider this bathtub if you are looking for something stylish and comfortable with easy installation. 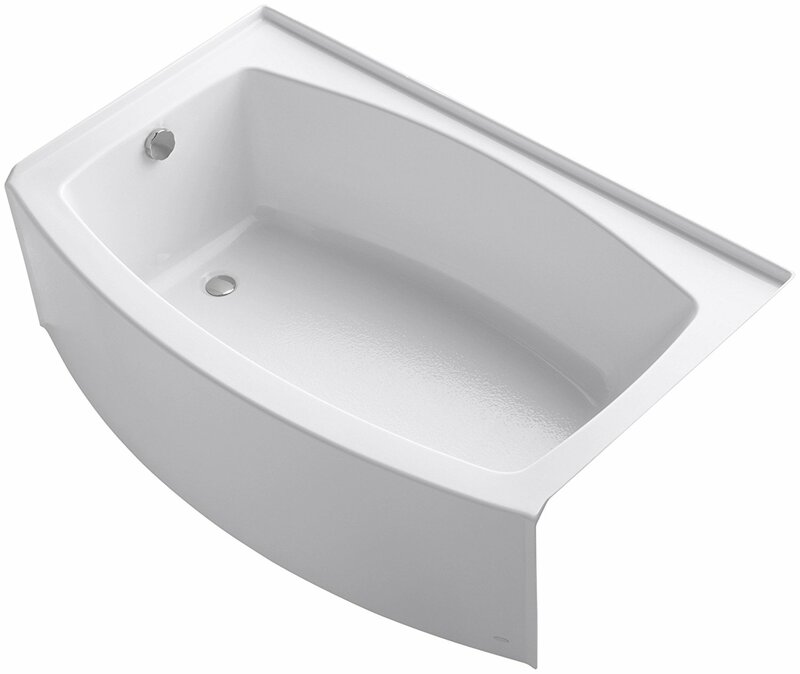 Another great bathtub from American Standard, Cambridge tub is made of durable Americast material. 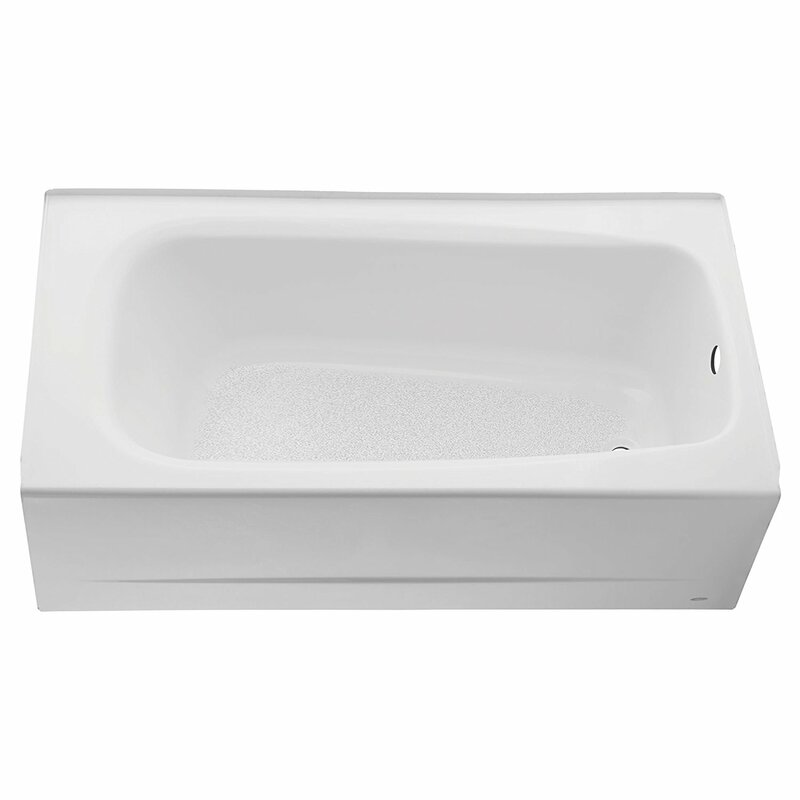 This tub offers a comfortable and relaxing bath with its beveled headrest and lumbar support. It is light and durable with easy installation. It features a StanSure slip-resistant surface for a safer bathing experience. Also, the surface is easy to clean and stays cleaner longer. The tub is sleek with a glossy porcelain finish. This left-hand drain tub is ADA complaint with the seat installed at the head end. 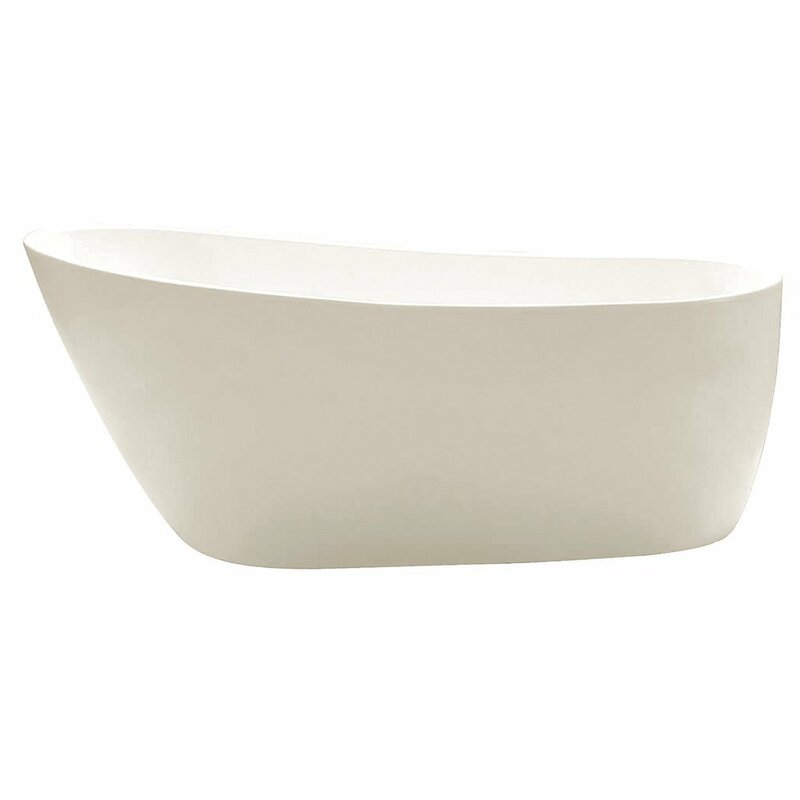 This Cambridge tub is perfect for a warm and relaxing bath as it keeps the water hot longer. Considering your requirements this tub might be the one you are looking for. AKDY is a well-known brand in the bathroom fixtures industry. It is very consistent in producing innovative, high quality and stylish products that enhance any bathroom. AKDY F278 is a new freestanding model. 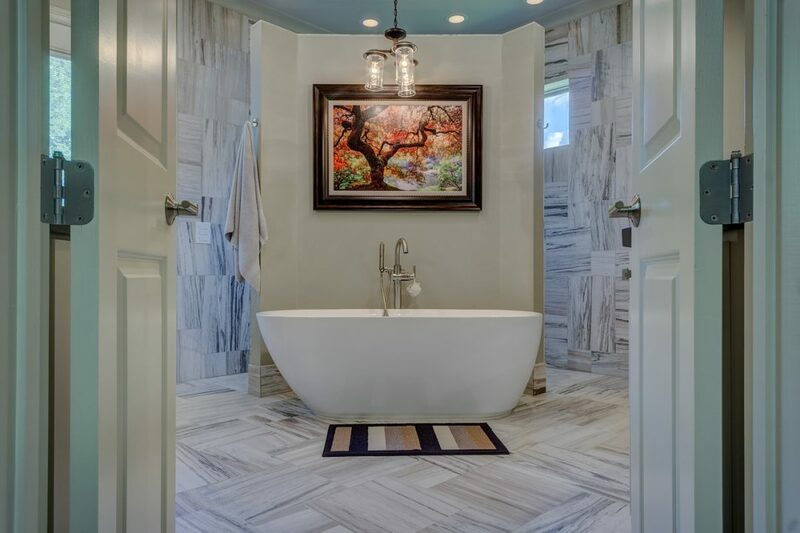 This acrylic bathtub let you treat yourself and soak in peaceful tranquility. This PureScape freestanding bathtub is as much ergonomic as it is stylish. AKDY bathtub offers the modern design and ergonomic features of the luxury tubs at a very reasonable cost. This stylish bathtub is pleasing to the eye and adds more elegance to any bathroom. AKDY F278 features antibacterial surface with high gloss white finish. The premium quality acrylic construction makes it strong and durable. This bathtub is easy to install with the chrome plated center drain placement. This stylish freestanding bathtub is the one for you if you want relaxing soaking and upgrade your bathroom’s look. VTRS592928 is a contemporary freestanding bathtub from Aqua Eden collection by Kingston Brass. This is perfect for unwinding after a long and exhausting day. It is made from acrylic and reinforced with fiberglass, which makes it durable and 50% lighter. The bathtub features a gently sweeping slipper on one end that gives it a graceful look while being ergonomic by supporting your back, neck, and head. You can recline against this sloping and enjoy the comfort at its finest and relax. This stylish and comfortable bathtub will easily turn your ordinary bathroom into a lavish spa. The acrylic surface is very easy to clean and is wear resistant. This bathtub has the capacity to hold up to 52 gallons of water, which is enough for a very relaxing deep soak. 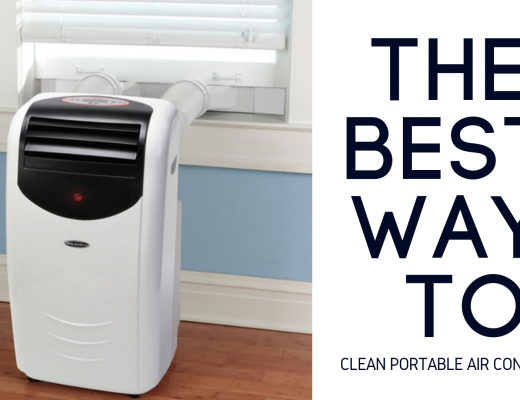 It has great warmth retention and includes drain and overflow. Clawfoot bathtubs look vintage and remind us of an older time. The Miller is an acrylic bathtub designed in a gorgeous slipper style clawfoot tub. This clawfoot bathtub has the capacity of 53 gallons and lets you have a good soak after a long tiring day. It is a durable and stylish bathtub. A good thing about this tub is that it comes with everything that you need to install a bathtub; bathtub filler, supply lines, faucet, handheld shower, drain, and overflow. Everything except the tub is beautiful rubbed bronze color that adds elegance to your bathroom. If you want to turn your bathroom into a vintage one, you should definitely get a clawfoot bathtub. This Miller bathtub is perfect for those who are looking for fashion, comfort, and affordability. Walk-in tubs are not just for seniors and physically challenged people but also for anyone who enjoys a relaxing bath. Most of the walk-in bathtubs have features like air and whirlpool tubs that let you have an amazing bathing experience. This walk-in bathtub features a high-quality acrylic tub shell and stainless steel frame. The tempered glass door and drain are located on the right side. The tub is very durable with acrylic sheet and fiberglass gel coat reinforcing. The Deluxe bathtub features 22 jets, 10 air jets, and 12 hydro jets. The tub features dual massage and has a capacity of 90 gallons. This is a great tub for soaking and relaxing bath. 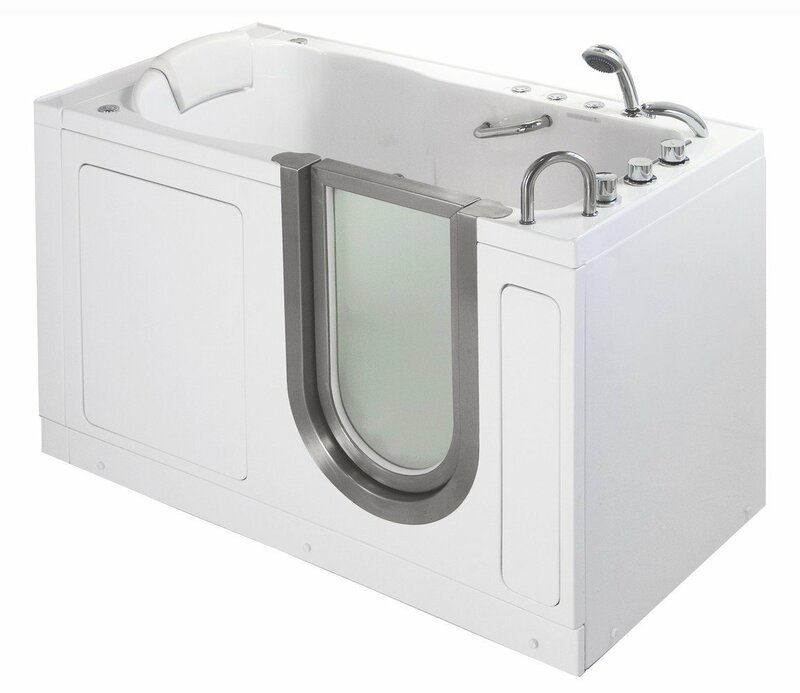 This whirlpool walk-in tub is more than just a bathtub it is a whirlpool Jacuzzi. Venzi is the soaking walk-in bathtub from Spa World that lets you enjoy deep soaking in standard size tub. 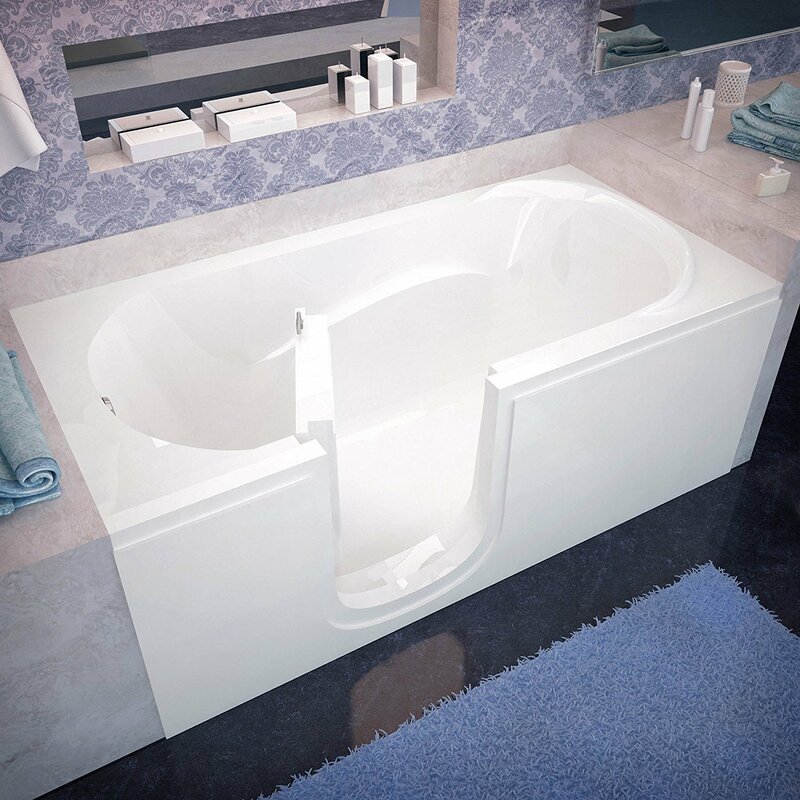 This acrylic tub is simpler walk-in tub than other walk-in tubs, which come with whirlpool jet features. This is simple and best of you just enjoy soaking quietly and relax. Instead of spending a lot for spa day you can turn your bathroom into your private spa. All you need is some scented candles and soothing music in the background. This tub is so deep that allows most of your body to be immersed in water. Since it is a simple walk-in tub with ADA compliant designs and features, it is perfect for elderly people who need assistance to take a bath in a normal bathing situation. This tub enables those elderly people to bathe independently and safely. Whirlpool tubs allow therapeutic bath by providing body massage with air and water jets at specific body parts. This Platinum whirlpool bathtub from Ariel features brilliant hydro-massage system with 14 multidirectional whirlpool jets. This whirlpool tub features 6 water-flow settings for customizable water action. The Platinum bathtub features acrylic and fiberglass design making it marvelous and durable tub. It includes chrome waterfall faucet and drain fixtures. Another awesome feature of this bathtub is the LED chromotherapy lighting that adds an extra element of serenity. It is a luxurious bathtub with a touch screen LCD control panel and Bluetooth radio. The whirlpool jets give you a deep massage to the pressure points of your body as you relax while soaking. Savona is a modern oval whirlpool tub from American Standard that offers you a refreshing and energizing bathing experience. It features the EverClean Whirlpool System with 8 adjustable jets, lumbar support, and dual integral armrests. The tub bottom is pre-leveled. It features deck-mounted On/Off control and two silent volume controls. The American Standard whirlpools feature the patented EverClean antimicrobial additive that is molded directly into the water circulation components to deter the growth of mold and mildew on the pipes. This whirlpool tub is great for relaxing and therapeutic bath. 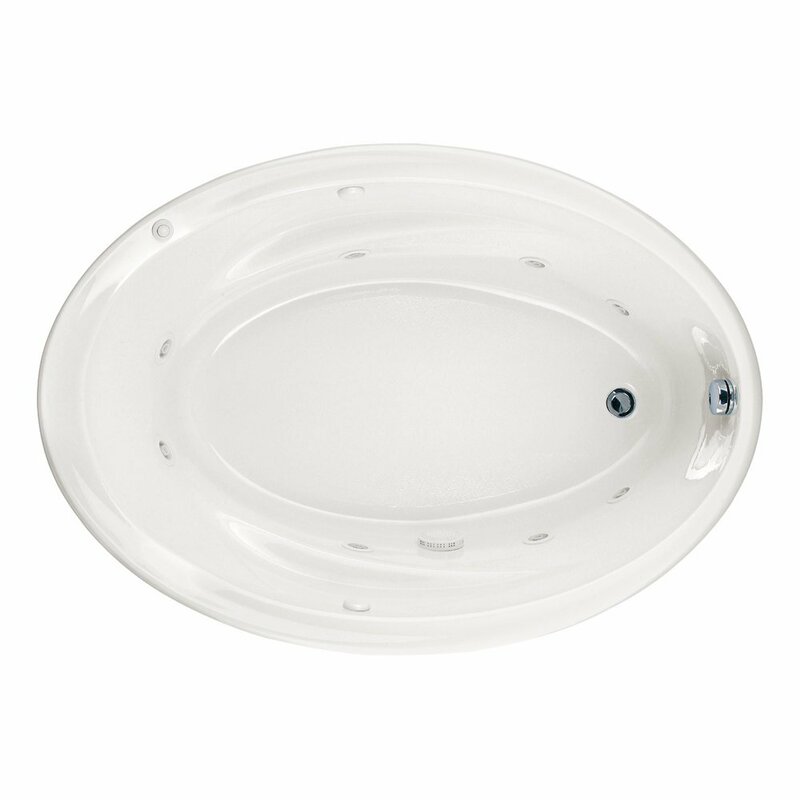 This tub is made of acrylic with fiberglass reinforcement making it durable and strong. You will not regret the deal for this amazing tub. Bathtubs are a great addition to any bathroom. You can have a more relaxing and energizing bathing experience with the right kind of bathtub. There are different types of bathtubs made of various materials and having various features. We hope that this post helped you to choose the right bathtub for you. 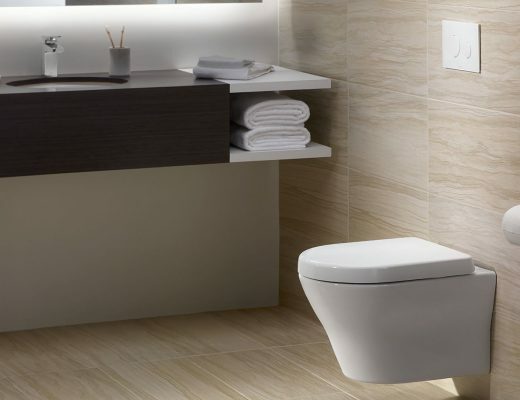 You might also want to check 10 Best TOTO Toilets 2019.